Three common types of software make you more vulnerable than you realize. While complete and thorough vulnerability management is next to impossible, a few simple steps go a long way toward reducing risk. 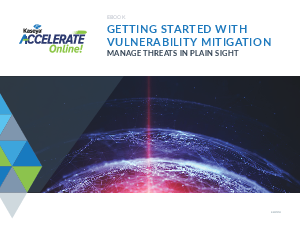 Download this ebook to discover what steps to take to begin evolving away from patch management toward software and vulnerability management. The hidden threat in securing your infrastructure from vulnerabilities lies with IT’s difficulty in managing third-party software. 2017 was billed as the worst on record for cybersecurity. No doubt, the continued rise of modern threat vectors has IT on high alert. In essence, IT professionals view their role as responsible for keeping the door shut. However, even with IT administrators keenly aware that most exploits can be averted simply by keeping the environment current, the task is no small feat and often isn’t done as well as it needs to be. Unfortunately, complete and thorough vulnerability management is next to impossible for a number of reasons. First, the sheer volume of vulnerabilities to accept, reject, or manually review is overwhelming. There is virtually no way to systematically go through all of them on a timely basis. So, IT prioritizes the work by what seems most critical. And as a result, much of its focus is often on Microsoft.